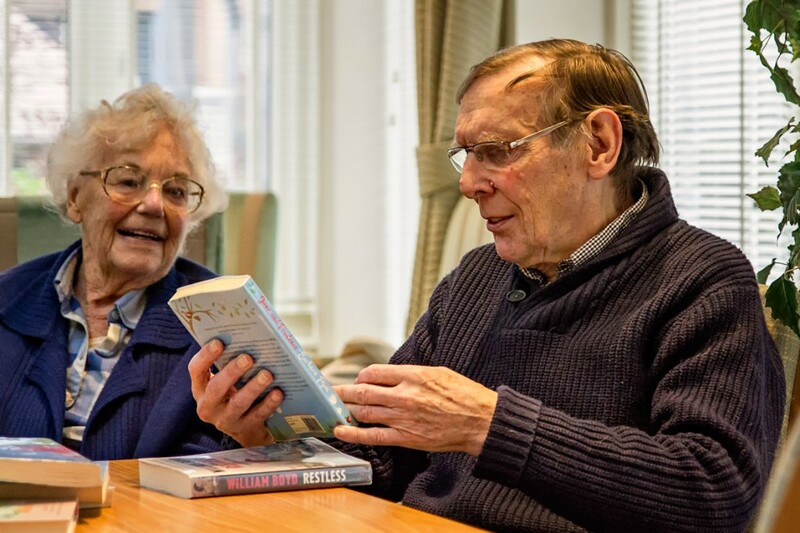 Bookfeast’s TeaBooks project organises sociable book groups for the over-60s. There are around twenty groups meeting across Oxfordshire every three to four weeks in a wide variety of venues, including libraries, cafes, sheltered accommodation, day centres and residential homes. What happens at a TeaBooks meeting? Most of our TeaBooks groups are very similar to any other book group, with everyone reading the same one or two titles at home, and then returning to the next meeting to share their thoughts and opinions about the book, as well as enjoying more general conversation! Some of our groups, where the participants are older or more frail, do not always take a book away to read, but will enjoy listening to and discussing short stories and poetry within the session. We currently have one group who have progressed to writing their own poetry! Click here for some of their latest examples. Why do we have TeaBooks Group Leaders? Every TeaBooks group has its own volunteer group leader who will organise all the books from the local library and bring them along to the sessions. This means there is no expensive book buying for the group members, and also gives the group members access to large print and audio copies if needed. As well as organising the books, the Group Leader’s most important task is to ensure everyone feels welcome and everyone’s opinion is heard. What sort of books does a TeaBooks group read? There is no such thing as a ‘typical’ TeaBooks book choice! TeaBooks groups read anything and everything from modern thrillers to historical romance, autobiographies to prize-winning literary fiction. For a full list of TeaBooks groups, including those which currently have spaces, click here. For a recent list of recommended reads – as enjoyed by our TeaBooks groups – click here. To see a copy of our latest annual evaluation, use this link TeaBooks Evaluation 2017 18 FINAL to download the pdf. TeaBooks is kindly supported by Oxfordshire Library Service who organise a special borrowing scheme for our volunteer Group Leaders.